Clean Camaro! Excellent running and powerful 383 stroker engine with 4 speed transmission. Runs and drives excellent with many receipts for recent work included. Only 2000 miles on the build. Like many enthusiasts I fell in love with the 1969 Z/28’s during High School in the 70’s. I drove a 1967 Firebird but my best friend had a fathom green 1969 Z/28 and boy was she a runner. The Z was stock with a 302 and a flat hood and the original owner had upgraded to the M22 Rock Crusher transmission. I liked my Firebird but you could say I was really in love with my best friend’s girl. In 2004 my dream came true and I found a very clean, running Z/28 not far from home on eBay. And for a shade over $16,000 she was mine. I had the shop where she’d been sitting bleed the brakes and change the oil to get my Z ready for the 80 mile drive from San Jose to San Rafael, Ca. By the fall of 2004 I was itching to get the car show worthy and, through the guidance of some great guys on an online Camaro forum, was introduced to Kurt Pedracci and hot rod machine in El Sobrante, California. Kurt ranks as one of the most genuine people I have ever met and he’s one hell of a mechanic. His shop as a muscle car playground with beautiful rods parked her and there and engine blocks, heads, carbs and intake manifolds neatly arranged inside the shop waiting to be united with amazing cars from the 1950’s or 1960’s. When I first met Kurt he had just finished Sean Penn’s 1965 El Camino and that was the closer for me. I had found my mechanic. Kurt kept the car for about 8 months and I spent almost $50,000 with him to get the car right. The Z’s block was shot and couldn’t be further bored so that was a non-starter. This was not a big loss as the block had been decked previously and was not the car’s original 302. Regardless the block was tired and needed to go. 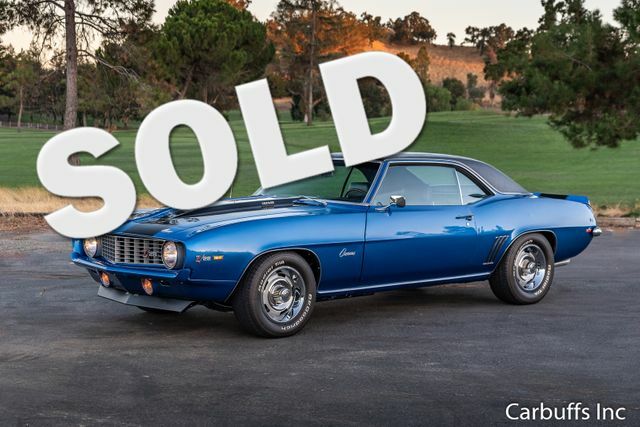 While the block could not be salvaged, many components under the hood were in good shape and were original Z/28 Parts including the double-hump heads, the Winters aluminum high rise intake manifold, deep groove pulleys and quick ratio power steering. As for the engine block, since we didn’t have the 302 to work with, Kurt and I opted for a 383 stroker, a powerful engine that delivers loads of torque. Someday this car should be matched with a period-correct 302 but we went the more “fun to drive” route with the 383 in 2004. Kurt hand-built the stroker from a 350 cubic inch block with 4 bolt mains and estimates it to make 475 to 500 horsepower. So the big question of course. Is this an original Z28? I’ve owned the car for 14 years and while I don’t know for sure, I think it is. The car was built in Chevrolet’s Van Nuys plant on April 18th, 1969 and delivered to La Coste Chevrolet in Rodeo(Bay Area), Ca. So the good news is that this is a California car and has like we never been exposed to icy conditions or road salt. The bad news is that, unlike the Norwood, Ohio plant, the Van Nuys plant did not use the X-codes on firewall trim tags to denote the Z/28 package making authenticating Van Nuys cars more difficult. I have interfaced with Jerry MacNeish over email the past several years and have asked him to inspect my car. Jerry lives in Maryland and travels occasionally to California but only when he has secured a significant number of cars to evaluate. In the past few years he has not attained the necessary critical mass in California to justify the trip West. Attached to this letter I’ve included some part numbers and date codes that I have recorded from the car. I have not completed an exhaustive audit of every component and part number as Mr. MacNeish would do were he to evaluate the car.